Anne R: "I have acquired what I believe is a fantastic original Peter Helck painting and I was wondering if you could help me verify its authenticity? Thank you in advance for your consideration." Anne, congratulations on the purchase of this beautiful painting! 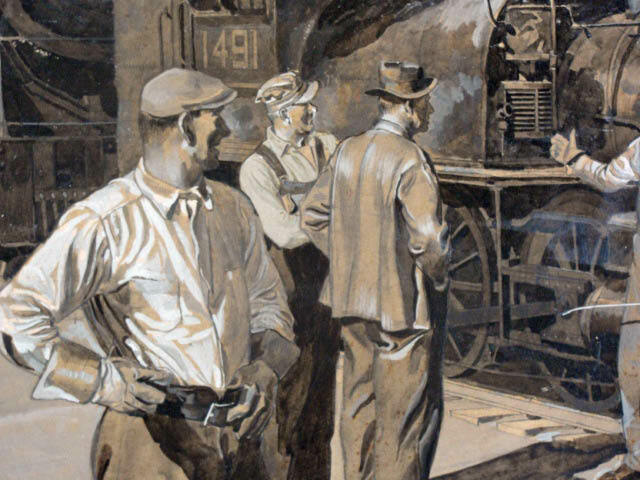 Two experts with special knowledge of the art of Peter Helck have commented on your painting. Images and Comments from Anne R.
Anne R: "The painting (not including the frame & mat) is approximately 15.5" across and 13.75" top to bottom." Close-Ups of the painting. 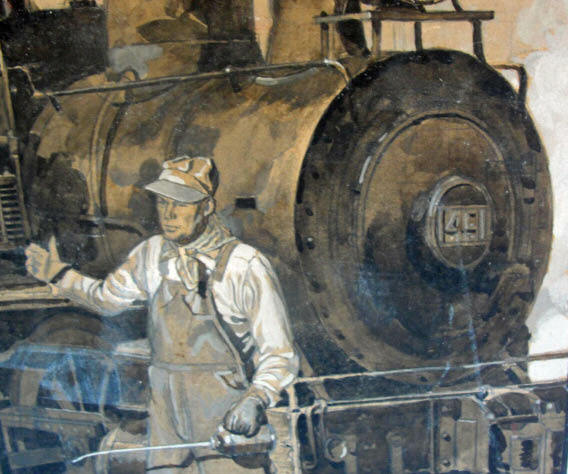 Peter Helck's signature on the lower left corner. The inscription on the lower-right corner reads: "With kind Wishes to (or TA) Cooper." Anne, based on Helck's distinctive style and signature, I believe your painting is an original Peter Helck. But, I went to two real experts to be sure....Tim and Jerry Helck. Tim Helck, grandson of Peter Helck and webmaster of peterhelck.com: "It's definitely a Peter Helck, though I can't find it in the work log." Jerry Helck, son of Peter Helck: "Tim has already responded positively to Howard and I agree that this is PH's work. Beyond that, I think it was most likely a story illustration from the early 1930s. 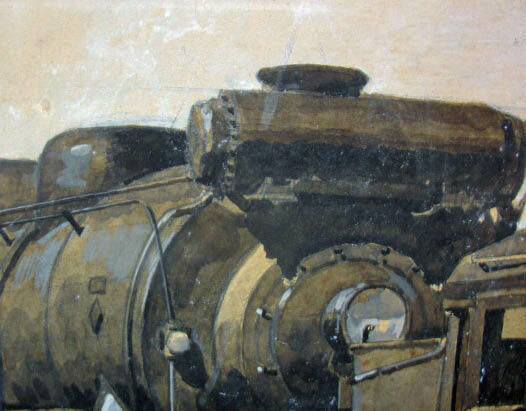 I too searched the Work Log and found two possibles: (no references to "Cooper" though until 1958, definitely not relevant) "Train Drawing - old and new locomotives" for Cosmopolitan, Aug '33 "Railroad Story" for Crowell Colliers, 2/7/34. 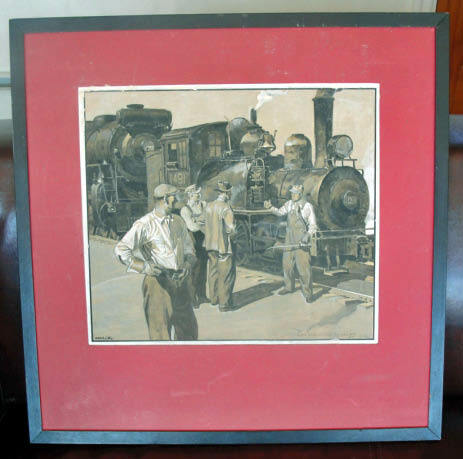 Update from Jim Blanchard (a Peter Helck enthusiast):"Hi Howard,So far, of the two leads provided by Jerry, I only found the Colliers Weekly illustration and it is not the painting we are looking for. Stay tuned, but my hunch is the painting was done prior to 1933. 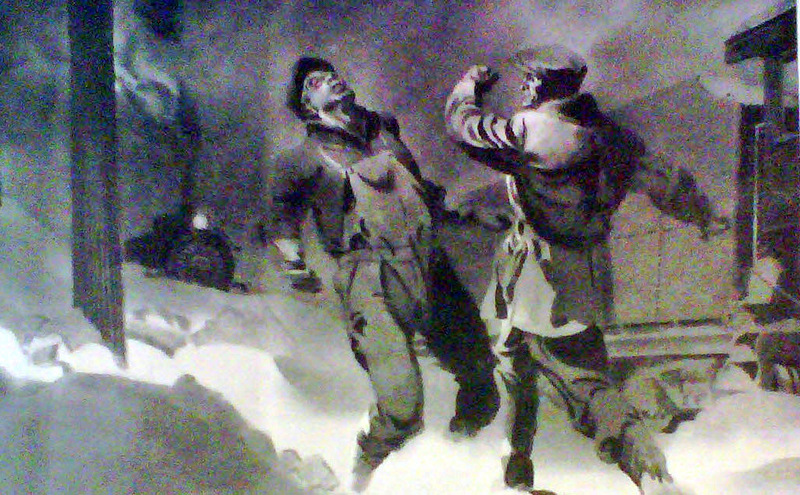 Here is the Colliers illustration that appeared April 28, 1934 in a railroad story "Danger Point". Thanks Tim, Jerry and Jim for your assistance and contributions to VanderbiltCupRaces.com. If you have any questions about your Vanderbilia, please forward an email and jpeg to me at Howard@Kroplick.com . Wonderful thread here! Who is this mysterious Cooper? “Nice sleuthing, Jim! With a few more examples, it should be possible to estimate a painting’s date just by the form of signature. I remember my father telling me that when he was a kid, a popular comic strip was Clarence the Cop, and no boy wanted to be called Clarence. The problem was that my grandmother was Clara….and my father was particularly careful not to offend, so over the years his signing went from Clarence Helck, to Clarence Peter Helck, to C. Peter Helck, and eventually to just HELCK. Stay well, you all! This whole thing is so interesting to me,that it’s so involved and you Howard are being so helpful to get to the bottom of the whole thing,what a guy you are,you’re always on the spot when needed,leave it to you and you’ll find the answer to almost everything that’s available.